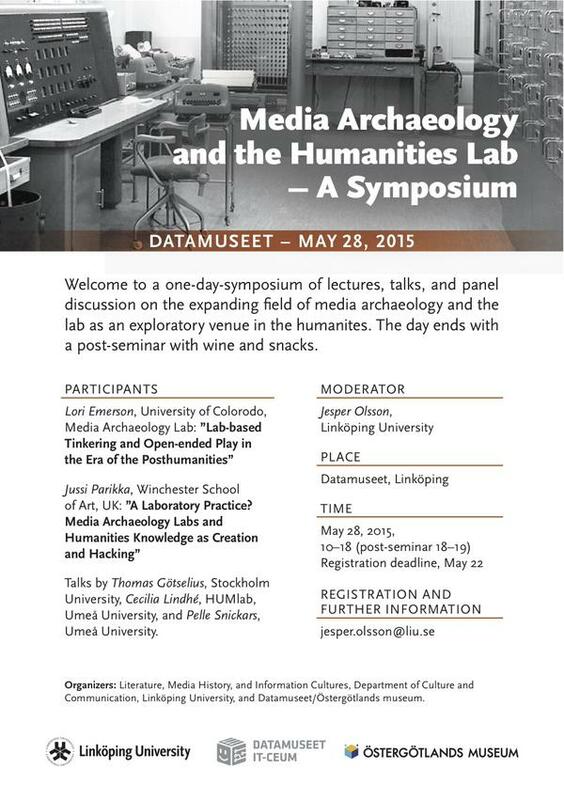 On Thursday, I am one of the participants in a symposium on labs in the humanities and media archaeology. In Linköping (Sweden), the event organised by Jesper Olsson addresses the question of institutional forms of media and humanities work. It is an exciting event for many reasons, andit is a good platform for some of the ideas me and Lori Emerson together with Darren Wershler have been thinking about relating to the genealogies and current institutional forms of the lab in digital humanities but also in those practices (such as Media Archaeology) that border digital humanities and might help to extend its reach to address the material cultural reality. Indeed, in a recent interview I conducted with Wolfgang Ernst, he underlined that we also need to address the “humanities of the digital” that could then offer also a longer historical trajectory to the question of technology in humanities theory and pedagogy. This would also include a reflection on the specific institutional sites for such scholarly activity. It also continues my interest in “techniques and practices of theory”. A follow-up to the Linköping discussions is organised as part of the Media Art Histories 2015 event in Montreal in November where we have a panel on this topic of labs across digital humanities, media archaeology and more. I’m interested in the practice of theory myself. Have you previously discussed this subject elsewhere online, or in book-form, perhaps? We briefly touched on this in our intro (with Michael Goddard) to the special issue on Media Ecologies: http://seventeen.fibreculturejournal.org/ ! I have to think if I wrote about the topic somewhere else more – nothing extensive as of yet, just mentions in some talks, etc.